Imagine having a gorgeous, natural-looking smile in just two appointments! Tell Us: What's Holding You Back From Smiling? "I wish my smile was brighter." "My teeth look worn out." "I have broken, chipped teeth." "I wish my smile was straighter." "My teeth seem irregularly shaped." "I have gaps between my teeth." A veneer is a thin tooth-colored cover that bonds to the front of your teeth. It’s a very popular solution for our New York patients because of its incredible abilities to change the color and shape of your smile. Every smile is unique. This consultation is the opportunity to sit one-on-one with our New York cosmetic dentist and discuss your likes, dislikes, and how veneers will fit your facial features. Our doctors prepare your teeth and take digital impressions to our master ceramist to craft your permanent veneers customized to your smile. While we wait for your new smile, our doctors will place temporary veneers so you can walk out of your office with a new smile! 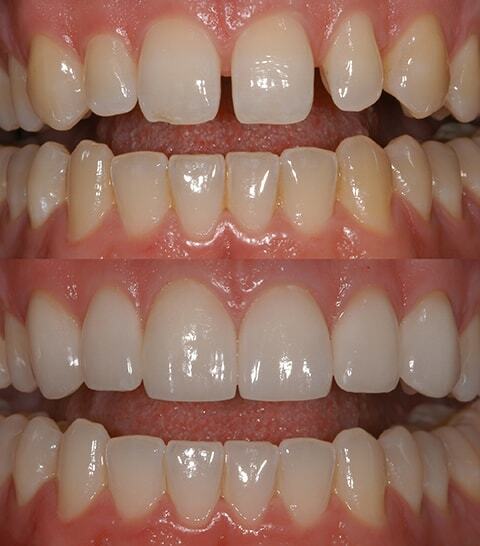 After 2-3 weeks, your permanent veneers are ready! We’ll place your veneers and make any final adjustments, so your new smile is truly yours. An artistic touch with a scientific approach. Beautiful, Healthy Results — Your cosmetic dentists at Midtown Dental Excellence are artists and have the eye to ensure your new smile is truly customized to you. The results are so beautiful, patients are motivated to take great care of their new smile to keep it for life. Caring Experts — With years of training and mastering techniques, our experts always strive to provide long-lasting results. This means paying attention to every minor detail and making sure you love your new smile. Digital Technologies — Cosmetic dentistry results would not be possible without the best technologies. At Midtown Dental Excellence, we have the Trios Digital Scan, CT Scan, digital x-rays, and Intra-oral camera to make your experience easy and enjoyable. Have Questions about Porcelain Veneers? What types of problems can be fixed with dental veneers? Veneers fix a variety of dental problems ranging from cosmetic to improving teeth’s functionality. Teeth that are discolored, worn down, chipped or broken, misaligned or have gaps are all great qualifications for veneers. 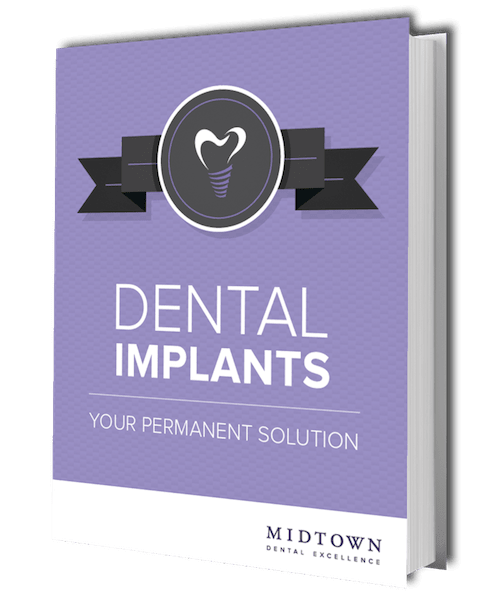 What is the procedure like for getting a dental veneer? A dental veneer usually requires three separate trips to the dentist, starting with a consultation where we will discuss the procedure in detail and your exact desires. At your next appointment, you undergo the prepping process. Finally, at your last dental visit, you get your veneers permanently cemented. While both give coverage to existing tooth structure, a veneer does so by only covering the front aspect of the tooth, whereas a crown covers the tooth entirely. A veneer requires minimal tooth preparation and can be made with a variety of aesthetic materials to best suit your desires. What happens to my teeth after getting veneers? Will I get cavities? Your teeth’s integrity and structure are marginally compromised when veneers are placed on your teeth. Your veneers are insusceptible to cavities as long as you provide the proper care to your smile with regular flossing and brushing. Also, it’s a good idea to keep your sugar consumption low to prevent further decay. Your veneers can last for a long time. The average timespan is seven to 20 years. While the veneer is inert, your teeth and surrounding gum tissue may change over time. This is why it’s important to keep up with your regular cleanings, brushing, and flossing to keep your smile healthy. The better your homecare and more frequent your trips are to the dentist for routine checkups, the longer they will last. If your veneer comes off, it can generally be rebonded. Yes! It is essential to practice optimal homecare and professional routine dental cleanings on a consistent basis to keep your veneers looking and feeling beautiful for as long as possible. Our office has state-of-the-art technology and specific products, such as MyntSmile to help keep your veneers in great shape! During your consultation, we will discuss these type of questions. Generally, patients go for teeth whitening for the lower teeth to ensure a good match. Porcelain veneers never stain! However, your natural teeth do generally stain, and we recommend looking after them with regular hygiene and maintenance procedures. Yes, alternatives to veneers include bonding and crowns. Veneers offer an excellent intermediate option. Veneers are ideal if you want to change the shape of your teeth more than just a little bit – as is done with bonding – but not enough to require a crown. Schedule your cosmetic consultation and let's talk about your smile goals!